Warm wishes for a restful and restorative Thanksgiving break. We look forward to welcoming you back with the start of Winter Term. THANKSGIVING CARD, 1912. 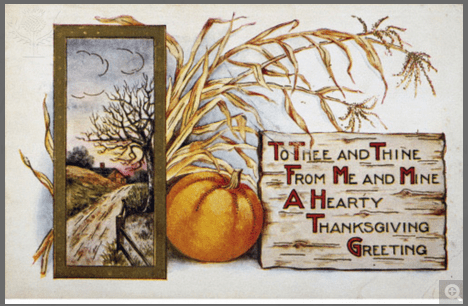 – ‘To thee and thine, from me and mine, a hearty Thanksgiving greeting.’ American greeting card, 1912.. Fine Art.Encyclopædia Britannica ImageQuest. Web. 9 Nov 2015. Best wishes from the library for a relaxing and scrumptious Thanksgiving Recess! The library will be open the Monday and Tuesday of Thanksgiving Recess week, from 8:30 am to 5:00 pm. The library’s digital collections are always open. If you are off the grounds for the break, please first log in to vpn.sps.edu to gain access to the library’s digital holdings. Best wishes from the library for a relaxing and scrumptious Thanksgiving Recess. The library will be open the Monday and Tuesday of Thanksgiving Recess week, from 8:30-5. Mrs. Neales decorated the [Lower School] dining-room very tastefully for Thanksgiving Day. Fir trees were placed in the corners of the room, and the fireplace was filled with different fruits of the harvest. For the Thanksgiving dinner alone, were needed 73 Vermont turkeys, 49 Virginia hams, 2 barrels of sweet potatoes, 5 gallons of olives, 50 dozen bananas, about the same number of oranges, 88 boxes of sardines, 4 gallons of olive oil, not to mention all the delicacies, such as lettuce, nuts and raisins, cranberries, grapes, and the other things that go to make up a proper dinner for the feast.